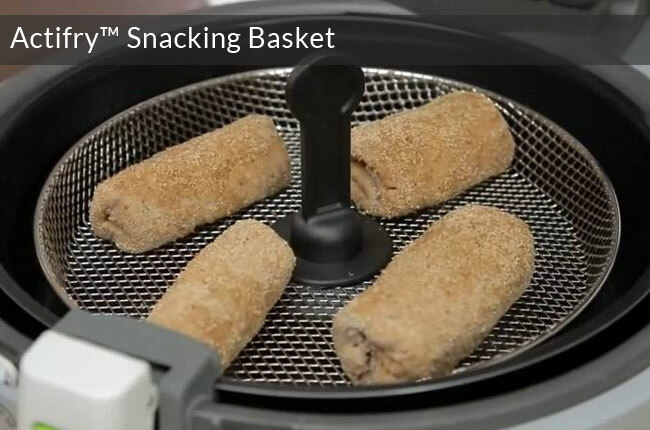 An Actifry Snacking Basket is an accessory that comes in the box with the Actifry Snacking model. The basket is also sold as a stand alone unit. The SEB /T-fal parts UK site says the basket will work with the following range of Actifry models: GH80xx, FZxx, and AL80Xxx . So that (“FZxx”) should mean that it will work with the Actifry Classic, original models. The GH80xx means that it will also work with Actifry Plus models. By giving an Actifry a paddle-free top tray, it gives a Classic Actifry capabilities that are very similar to the Actifry 2 in 1, with its solid metal top tray. See here to understand how the Actifry Snacking Basket works in operation. But if you already own a Classic Actifry machine, I’d say getting your hands on one of these basket babies is top priority because of how much it will extend the capability of your machine at relatively little cost. As of spring 2015, Canadians can buy it at Canadian Tire for $29.99. As of summer 2018, it’s also on amazon.com. Note the snack basket is actually, technically 3 separate parts : a black base to support it, the grilling basket, and the actual handle for the grilling basket. Those can also be purchased separately should you have an issue with one of those. The part # for the snacking basket is: XA701073. Here is a link to the snacking basket on the UK part site. Here is a link to the snacking basket on the Irish part site. Here is a link to the snacking basket on a New Zealand part site. If you find it offered elsewhere, please let us know so we can let others know, thanks. I found a new source for the “snacking grid” basket. It’s an online parts shop located in New Zealand. And fortunately they accept and ship orders for/from US customers. I just placed an order. Evidently it was the last piece in inventory. But the good news is that the web site informs new visitors about the stock situation. So you may have to check back. I sent them an email inquiry and I received a response within 24 hours. I should have noted that Need A Part thoughtfully offers to take your email address if they are out of stock. So you will receive a notification when it becomes available again. Thanks for the heads up, Marc. Much appreciated. If you remember, report back on how it works out for you when you get it. I received the Snacking Basket on schedule. It took about a week after NeedAPart confirmed shipping. I’ve used the snacking tray twice so far. I used it to prepare frozen cherry blintzes (wrapped filling in a crepe wrapper). I lightly sprayed Canoloa oil (from Costco) on the blintzes. The result was good. Golden brown outside and flavorful filling. Last night I made mini meatballs to include with a pasta dish. The meatballs cooked thoroughly all around in 6 minutes. And the beef came out slightly pink and juicy just as I had hoped. Another minute or two would yield well done meat if you prefer. All in all I am pleased. I can recommend the supplier and the snack tray. I can’t imagine any owner of a classic Actifry model who wouldn’t want the snacking basket accessory! The blintzes and meat balls both sound like a great idea. 6 minutes is pretty darn fast for meat balls, especially considering you don’t have to stand there and watch them. I have the “Actifry Family” model. How can I find a basket compatible? I also don’t know if any such similar grilling attachment is or will be ever available for the Family Size Actifry. The snack basket discussed on this page will not work with the Family size. You should write T-Fal and let them know you want them to make one. If enough of us did, I’m sure they would think of something! The basket arrived in Canada finally as of March 2015; I’ve updated the page to indicate this. It’s at Canadian Tire stores across the country; perhaps other stores as well, but Canadian Tire is the only store I know of at this point. I can confirm having just got back from Canada, that the Tire shop in Toronto has these in stock and on the shelf. the handler of the basket is very hard to remove once it is on. not sure if I can just leave it when I cook or not….. The U.S. version of the Actifry (Model T-fal FZ7002) looks to have slightly different dimensions than that of the U.K models.. anyone know if the snacking tray would still work? Although, what would be the difference if instead of using the tray, I just remove the paddle? Hi Steve, there are several different “body casing” variations on the Classic Size Actifry that the Snacking basket was designed for. That model you cite is a pretty standard version of the Classic Size Actifry and yes, the Snacking Basket will fit it. Many people do just remove the paddle and cook in the pan, essentially using the machine as a mini convection oven. The snacking basket however would allow air currents to come up underneath the food to crisp and brown it all round. The downside with the snacking basket is that you can only use either the pan or the snacking basket at the same time. If you really want a model where both actions can happen at the same time, then it’s the more expensive model called the 2-in-1 that would provide that feature. But who knows what T-Fal will come out with in the next 12 months, they are on a roll pumping out variations. Yes re the meat / cheese fried pies. Spray with cooking spray or brush lightly with oil first? I cook spring rolls from frozen right in the pan, with the paddle, they stay together and turn out pretty close to deep fried. Close enough for my tastes anyway, given the added healthy factor.